This orchid, which is honouring the French botanist Gaspard Nicolas Robert (1776-1857), is unusually vigorous and 20 to 50 cm tall. The 5 to 10 strong foliage leaves are light green, unspotted and formed as a basal rosette. The cylindrical inflorescence consists of 12 to 70 large flowers, each one supported by a long bract. The spur is conical, short and directed downwards. Petals and the middle sepals form a loose hood. The lateral sepals are spreaded sidewards. 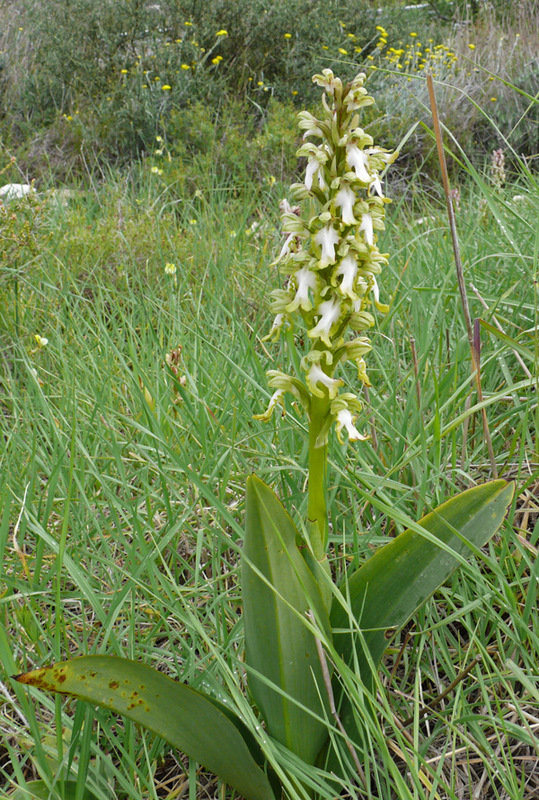 The labellum is deeply three-lobed, with the middle lobe much longer than the lateral lobes and divided at the end. The French botanist Jean-Louis-Auguste Loiseleur-Deslongchamps (1774-1849) named the plant Orchis robertiana in his Flora Gallica (1806). Filippo Parlatore (1816-1877) transferred the species to a new genus Barlia, named after Jean Baptiste Barla, and described it in 1858 as Barlia longibracteata. In 1967, the Swiss botanist Werner Greuter renewed the first definition and described the plant as Barlia robertiana. In 1999, Pierre Delforge put the species to the genus Himantoglossum and described it as Himantoglossum robertianum. The standard colour of the flowers is crimson to purple with darker parts at the end of the lobes and bright parts in the middle of the labellum. 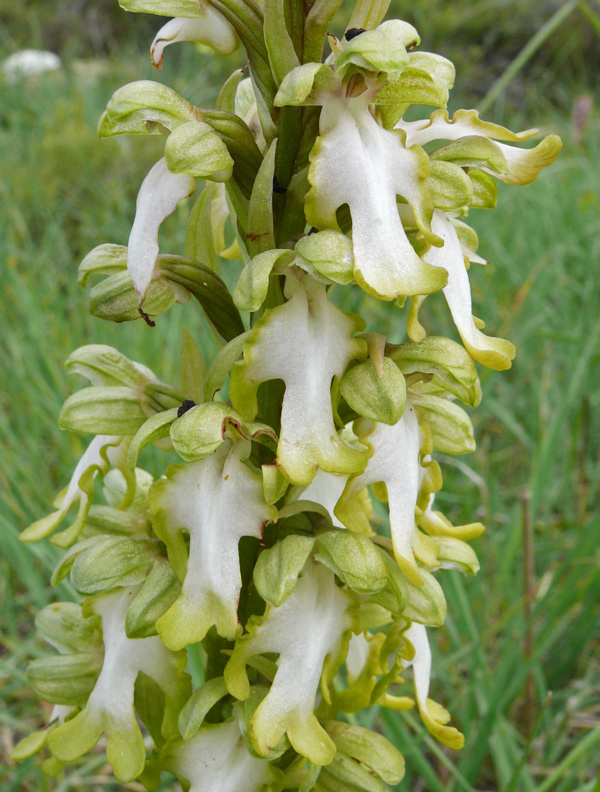 Paul Delforge mentions that hypochrome forms are quite frequent – these plants have a green hood and a white labellum with green lobe ends. Himantoglossum robertianum is growing in neglected grasslands and light woods, up to 1700 m. Bloom is rather early from February to April. The species is distributed throughout the entire Mediterranean region.